1/2 yard Loop Fringe 1"
1. Cut 2 squares of daisy fabric 17" X 17." 2. Cut two 17" X 10" pieces for the envelope top from the blue fabric. Fold these 2 pieces in half and draw a line from the bottom outside corner to the top center fold line. Cut on this line. 3. Open out the pieces just cut. Lay right sides together and stitch along angled sides leaving bottom for turning. Turn and Press. 4. Place envelope top on the right side of one 17" X 17" with raw edges together and stitch across. 5. Press 1/2" for a 1/4" finished hem along the top of second square. 6. 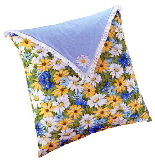 With right sides sew the pillow front to the pillow back on 3 sides, leaving open at top. 8. Hand sew snap to inside of envelope about 1 1/2" from point. Hand sew other side of snap to corresponding point on the pillow. 9. Iron or hand stitch the appliqué over the snap stitches on the front. 10. Insert the pillow form and snap closed.